Okay so the days are getting longer, the snow is melting away and Old Man Winter is finally loosening his grip on your patio. It is time to shake off the winter blues, hear the sizzle of meat hitting hot grates and put some sweet blue smoke in the air! At Big Guns HQ that also means its time to give everything a good cleaning, a tune up and some love to make sure it is ready for the upcoming year. We all know that guy or have a friend that insists on never cleaning their cooker, swearing that it will ruin the “seasoning”. While it’s true that a well seasoned pit is a happy one it’s also true there is a huge difference between seasoned and funky. Seasoning shouldn’t drip down nasty globs of black gunk onto those beautiful candy apple red ribs or leave little crunchy bits of Christmas turkey on your prime Porterhouse when you flip it over. It doesn’t matter if you have a gasser, Yoder Smokers YS640, 48″ Yoder Flattop or a blinged out YS1500 on a comp cart, your cooker is a machine. Machines need maintenance. That’s a simple fact of life. Some need more than others but they all need a little love now and again. Another fact of life is that cleaning your cooker(s) is dirty work. Make no mistake, you are going to get dirty doing it so don’t wear the new hoodie the kids gave you for your birthday or your cool new custom Vans. Now there as many different ways to clean your pit as there are brisket recipes and this is by no means the only way, it just happens to be the way I do it. More important than how, is the fact that you actually do it. The first thing I like to do is take my cookers off the patio or deck and put them out in my gravel driveway where I don’t have to worry about things dripping or dropping onto the ground. I then like to fuel them up and light the fires, get theme heated up nice and hot. For the grill it means a high heat ( hand over the flames 3-5 seconds) and my smokers I like to get up to 350-400. This loosens up the grease and crud and makes it easier to remove. While the fires are warming up I gather up all the tools and equipment I’m going to need. 02. An apron. I know you listened and wore the old sweatshirt but put on an apron you don’t mind getting dirty. Trust me. 03. Grill brushes. I use wire brushes and wood brushes to remove debris from grates. 04. A good degreaser like Safecid. By now your grill should be nice and warm. The first thing I do is brush off all of the grates,starting at the top and working my way down to the bottom. After brushing, I pull the grate out and use the putty knife to scare off any excess still clinging to the edges, especially the bottoms and grooves where it slides in. I then set them off to the side in a large tub or sink if you have one. If your smoker has a deflector plate like the Yoder pellet cookers give then the same treatment, except start with the putty knife and finish with brush. After the grates, I start with the insides scraping off any excess grease from top to bottom once again paying particular attention to and grooves where grates mount. I like to use 2 scrapers a wide one and narrow to get into nooks and corners. Don’t forget to clean the chimney. You can tell the people that forget about this by checking out the stalagmites the have have hanging around the edges and the black streak underneath it. At this point you will probably have a fairly nice collection of nasty in the bottom, use the scraper to scoop anything loose. Next up is the degreaser. Your cooker should be cool enough to touch bare handed by now so go ahead and liberally spray everything inside, both the cooking chambers and firebox, taking care to avoid soaking any electronics like igniters. Give it a good scrub with the green pads, keeping them soaked in cleaner and changing them often as they get clogged up. When finished go ahead and rinse everything off, once again avoiding getting electronics wet by covering them. The inside is done so go ahead and spray the grates deflector down with the degreaser. Now here you can do a couple of things. If you happen to have a pressure washer go ahead and rinse them off with it. If not, you can put all of your grates in a trash bag and haul them down to a local car wash to rinse them off. Just be aware many car washes don’t really like people doing this which is why I don’t recommend taking the whole cooker there to clean. In my case the local guys tend to mind a lot less when I happen to have a rack or two or a tray of pork for them. 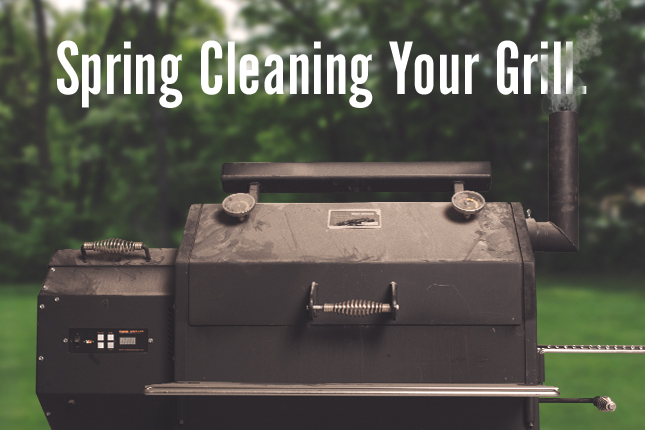 Whether you use a hose, pressure washer or car wash keep in mind they are going to splatter grease all over so be careful and clean up after yourself. Your significant other or car wash guy will appreciate it. Now that we have the working parts clean its time to make the outside all nice-nice. I’m as much into the rat rod and bike scene as the next guy but for some reason that same aesthetic doesn’t carry over into the food prep realm for me. I take a minute or two and knock off any rust with a brush, sandpaper or steel wool the spray the whole thing down with degreaser and wash it off with the green pads. Make sure that you keep the surface wet so the green pads don’t scratch up the paint. If you have a stainless outside, I would use a sponge, not the green pads. Rinse her off and after it dries hit up any bare spots with the high temperature paint. I like to use Rustoleum to help prevent rust from coming back. Take your shelves off and after cleaning, hit them up with a little polish or metal cleaner. Remember the Windex commercial that said “it ain’t cool if the chrome don’t shine!”? Make that bling stand out, you spent enough money on it. There you have it, that’s the BGBBQ annual maintenance program. I know it sounds like a lot but hey if you keep up with cleaning throughout the year it’s not that bad. It doesn’t matter if you are a contest cook or a backyard guy, we all like to show off our cookers and with a little elbow grease you should be able to make your’s the center of conversation for years to come.